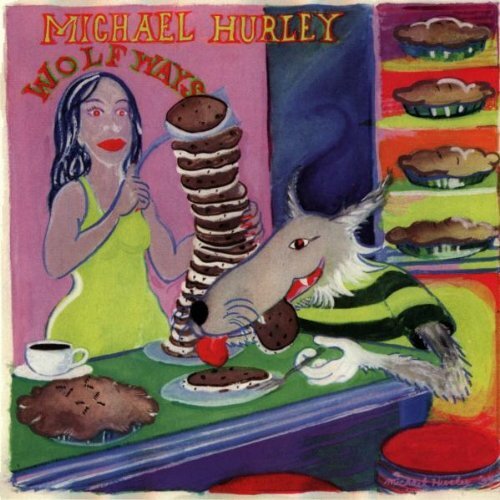 Michael Hurley is one of my favorite musicians in the world. His songs have that perfect balance of rawness and beauty that makes for real musical honesty that I can't get enough of. He has been putting out records since his release First Songs on Folkways in 1964, but has successfully avoided getting popular (though I'd definitely call him famous, at least among music nerds). Another thing I like about his music is that he often sings about pies (and paints them too). I could go on for quite a while about his music and art, but since this is a pie blog, I'll cut to the chase. Check out some more of his pie songs, Water Train and Hoot Owls on Hi-Fi Snock Uptown (1972, and re-issued on Mississippi last year), as well as the rest of his catalog as soon as you get the chance. thanks for having me on the pie blog. I remain a huge fan of pie. it and tea are about the only consumable vices left to my options. a apple, pear, strawberry, blueberry, pies with no sugar but with honey and a whole wheat crust, they can't kill ya in moderation. I go into this place...my most frequented restaurant in portland, an americanized burrito joint, and they always have two pies they are selling slices out of, baked elsewhere, last time it was the ginger/pear, I order my burrito to eat there and get a slice of pie to go for late night when all the restaurants are closed and I'm hungry again.